Michael Madsen wants to Save Ray’s Balls! Hollywood actor Michael Madsen, best known for his roles in films such as Reservoir Dogs, Kill Bill and Sin City, has thrown his weight behind a web-based campaign to save an iconic piece of Americana. 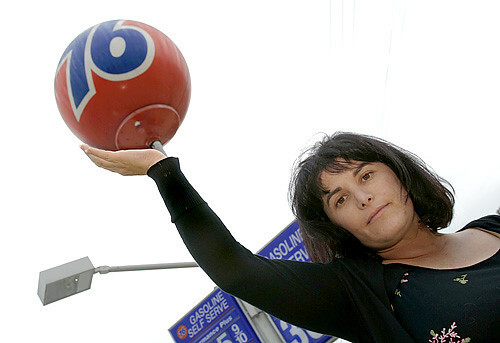 The Union 76 petrol station signs, otherwise known as the "76 Ball", have been a feature of the Los Angeles landscape for nearly 50 years. The large orange spheres were created by designer Ray Pedersen for the 1962 Seattle World’s fair. The signs have even had cameo appearances in Hollywood movies – one was knocked down by a rampaging T-Rex in the film Jurassic Park: The Lost World. But the 76 balls, which adorn petrol stations across the Western US, are being replaced with more conservative flat signs by Union 76’s Texan parent company ConocoPhillips, sparking a blog-based campaign for their preservation. Madsen said he decided to join the cause after seeing a newspaper report detailing blogger Kim Cooper’s efforts to save the historic signs. "There seems to be this driving force to tear down everything that’s a little old", he told the BBC. "These are things that were landmarks, it’s a symbol that I remember from childhood. What’s the point of smashing them and putting up flat signs?" In Madsen’s view Los Angeles’ increasingly bland environment is representative of a process of thoughtless modernisation that is taking over the movies too, "everything is just getting completely homogenised", the actor said. "I grew up in a time when I watched actors like Humphrey Bogart and Robert Mitchum… those are the movies that I liked and I responded to. "They’re all gone now and there’s no talent like that anymore, there’s no immensity of talent that exists like that in the motion picture industry. "Even the movies are turning into a bunch of junk. "They think if they put a handsome face in there or a good-looking body and they surround it with enough cars blowing up, that it is going to be entertaining… but in the long run it’s just not going to last. "It’s all empty, there’s no story anymore… the same thing is happening to the motion picture industry that is happening to the landscape." As well as lending his voice to the campaign Madsen has made a personal effort to save the signs from destruction. Having been tipped off about a facility where dismantled balls we being kept he attempted to purchase one, but was told that they were all going to be crushed. He said, "I get so mystified by things like that. Not only do they want to take them down, but they are going to make sure they smash everyone of them into pieces." The 76 Ball is not the first piece of disappearing street furniture that the star has attempted to save. He is also buying one of Britain’s old red telephone boxes in an effort to preserve a little bit of the London that he remembers. "I’m in the process of purchasing one of the phone boxes for myself and having it put up in the front of the garden. My kids aren’t going to see the same London that I saw, my kids aren’t going to see the same California that I saw."